Once a common sight in portions of Manitoba, Saskatchewan, Alberta, and British Columbia, the burrowing owl is now much more rare. The Canadian population of this little bird of prey has declined over 95 per cent since 1987, and now occupies a mere 36 per cent of its original distribution in Canada. This alarming rate of decline has motivated scientists to list the species as endangered under the Species at Risk Act. No single factor has been identified as causing the decline of burrowing owl populations in Canada. Instead, the cumulative impacts of several factors are thought to be responsible. Threats for burrowing owls include loss and fragmentation of grassland habitats, decreased prey, increased predation, inclement weather, vehicle mortalities, environmental contaminants, and loss of burrowing mammals in parts of the owls’ range. Habitat loss and fragmentation are of particular concern for the burrowing owl, because alterations to the landscape have likely limited the ability of habitats to provide vital ecosystem requirements. Burrowing owls also use burrows that have been excavated by other burrowing species, but historical land use practices and extermination of other burrowing mammals have limited the availability of burrows - making habitat rare despite the efforts of conservation minded landowners. Another threat the owl may be facing is the use of chemical pesticides to control grasshoppers and other insects, as it has a direct impact on the owl’s main food source. Vehicle mortalities also present a danger, as these owls tend to fly low when foraging for insects and small mammals along roadsides. The Canadian Wildlife Federation is dedicated to conserving and maintaining a healthy burrowing owl population across their breeding range within Canada. As part of CWF’s Endangered Species Program, we’ve partnered with like minded organizations such as the Calgary Zoo’s Centre for Conservation Research and the Manitoba Burrowing Owl Recovery Program. Reintroductions efforts have led to small populations in the southern Okanagan and Thompson-Nicola regions of British Columbia and the southwestern portion of Manitoba, but these populations need continued assistance. Take action to identify and manage areas designated as critical habitat. One of the most endangered birds in western Canada. 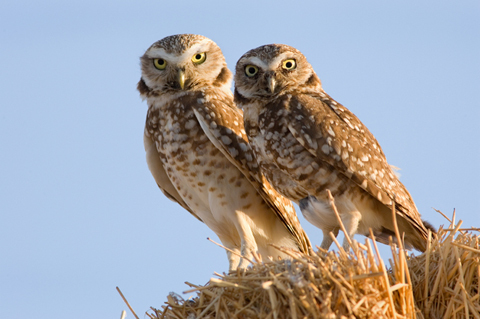 Burrowing owls are listed as Endangered under the Species at Risk Act. Standing about 20 cm tall and weighing 150 grams, the burrowing owl is slightly larger than a robin. Have a typical “owl” round head with large yellow eyes, and their legs are long, thin and bare. True to its name, the burrowing owl nests underground in burrows. Burrowing owls depend on pre-existing burrows provided by other species such as a black-tailed prairie dog (Cynomys ludovicianus), the American badger (Taxidea taxus), and richardson’s ground squirrel (Spermophilus richardsonii). Unlike most owls, the burrowing owl forages both day and night to accommodate a diet of insects and small mammals. This small owl mimics the hiss of a rattlesnake to warn off predators and makes a “coo-coo” sound to attract mates and defend established territory. 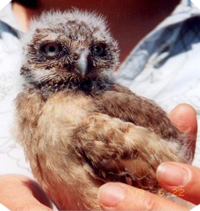 CWF funding is working towards helping the world’s smallest owl bounce back in Canada. Once common on the Prairie grasslands, the burrowing owl is now listed as endangered by the Committee on the Status of Endangered Wildlife in Canada.